Brand You is more than a snappy title. In my case, it is based on the belief that we have enormous, untapped potential. Some people have commandeered the paradigm as a novel, new (digital) age concept. But that is misguided: prior to the advent of the Internet we all had a brand, but would never have thought of it in that way. We would have considered our reputation or standing in the community. To be precise, what others thought of us. 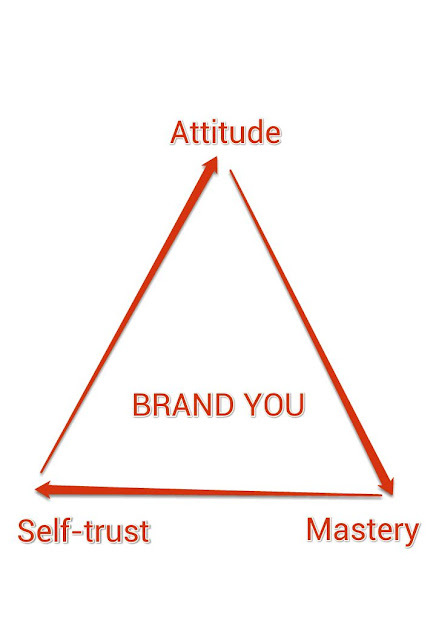 I have already distilled the component parts of Brand You: Mastery, Attitude and Trust, but I thought I would highlight why I believe these are so important. I could, of course, have taken any number of glorious headings but these, either independently or interdependently, have the greatest potential to develop Brand You. Mastery is not perfectionism. It is about getting better every day. It is about doing something for the sake of it. Yes, perhaps by rote occasionally (although that sounds rather mindless) but to be the very best that you can be. Mastery is a lifelong pursuit. It is not something that you tick off at 5, 10 or 25 years. The pleasure is in the doing not the getting. You know when you are in the presence of a master because they make everything look easy. In your case, you probably find, quite naturally, that you stick to doing the stuff that you enjoy and put in maximum effort, whereas the less appealing tasks tend to get less time and less focus. A master doesn’t distinguish between the two. S/he focuses on every task and gives it the same importance. Ask yourself, are you willing to put in the hours to be considered World Class? Are you willing to push through the tedium to become known as the Go To person in your sector? If so, you may just find that people start to see you in a different light. Attitude is not arrogance. It comes from the self-belief that anything is possible. In times past, I used to carry a set of cards around with me with positive affirmations (something I picked up from reading a Tom Hopkins book), which I would read aloud every day. I no longer feel I have to repeat a positive mantra but one thing it instilled in me was to think positive and not to dwell on the impossible but the possible. Too many people get dragged down by spending too much time thinking negatively or building impossible barriers that prevent them from ever fulfilling their potential. I am not suggesting that you should delude yourself to believing everything you say, but if you can assume a positive aura and not allow the negative, critical voice to creep in, life will take on a different hue. Trust is perhaps the most ethereal concept of all. In the case of Brand You, it comes down to trusting yourself, and the trust you have in others and they in you. There will be some people that think that trust is nothing more than a ‘soft’ virtue and it’s something you either have or don’t. And I can see, particularly with all the obvious gross breaches of trust in the market, why that might be the case. But trust, as a component of Brand You, is something that can be worked on (applying the pursuit of Mastery) and developed. One of the clearest examples of self-trust is that fact that very few people make written goals because they don’t believe they will stick to them. Likewise, procrastination is a breach of self-trust. To build greater self-trust it often means breaking our habits. We know we should do something different but we have habitually let ourselves down. This comes back to the idea of small wins. Rather than constantly biting off massive assignments – “I will do this or that” – we would do well to take apart each task and focus on one small aspect that we know we will achieve. As regards the relationships we have with others, the fundamental concept that we often forget is the Golden Rule – to treat others as we would wish to be treated. I am as guilty as the next person of ignoring this Rule. Of course, there are many other aspects to relationship trust like empathic listening, putting others first, doing what we say we are going to do and correcting mistakes without obfuscation but rather than carrying another list around with you, I much prefer to keep the Golden Rule as my number 1 principle. The components of Brand You may not appeal to everyone, but, one thing is certain, applied methodically, day-by-day, and with a focused approach on the possible, you have at your disposal the tools necessary to become what you truly are.